FENCES is directed by Denzel Washington from a screenplay by August Wilson, adapted from Wilson's Pulitzer Prize-winning play. The film stars Denzel Washington, Viola Davis, Jovan Adepo, Stephen McKinley Henderson, Russell Hornsby, Mykelti Williamson, and Saniyya Sydney. The film is produced by Scott Rudin, Denzel Washington and Todd Black. Download Fences in Digital HD from the iTunes store. Fences images are © Paramount Pictures. All Rights Reserved. Fences based on the Pulitzer and Tony award-winning play by August Wilson as part of his 10 play American Century Cycle, tells the story of a middle-aged working class family patriarch, in 1956 Pittsburgh. Starring and Directed by Denzel Washington (Equalizer), it features outstanding performances by the entire cast including Denzel Washington, Viola Davis (The Help), Stephen Henderson (Tower Heist), Jovan Adepo (The Leftovers), Russell Hornsby (Grimm) and Mykelti Williamson (Forrest Gump). The screenplay and the play it is based on are masterworks of American literature. The story begins with Troy Maxson (Washington) and his friend and co-worker Jim Bono (Henderson) finishing their work day as garbage collectors and coming home on Friday afternoon with their paychecks and a pint of booze. They arrive at Troy's home and are greeted by Troy's wife Rose (Davis). As Troy and Bono settled in the backyard and continue to drink the pint and banter back and forth with Rose joining in on the conversation. In the course of the conversation Troy begins to express his frustration about being kept down by society, notably his being barred from playing baseball in the major leagues because of the color line that was in place until he as too old to be signed by a club. During the evening we are introduced to Troy's older son from a previous relationship, Lyons a talented but struggling musician, who has come to ask his father for some money, Troy begins to berate his son about his inability to support himself until Rose finally ends the verbal assault by giving Lyons the $10. We meet Troy's brother Gabe, who received a traumatic brain injury fighting in the Pacific during World War II and now spends his days chasing hell hounds and speaking to Saint Peter guarding the gates of heaven. Lastly Troy's younger son, Cory who is being recruited to play college football, and is chafing under his father's oppressive rule. Over the next few Friday evenings, through the conversations with Bono, Rose, Lyons and Cory we delve deeper into Troy's regrets, disillusionment and perceived injustices he has experienced through his life. His experiences have led Troy to take advantage of everything and everyone in his life. He lives his life as a baseball metaphor; three strikes (missteps) and you're out, the pitcher gives the batter no gifts and as a batter or baserunner you take whatever chances come your way, even if means stealing. Troy is stuck living in his past, which is the foundation for his relationships with those around him. The movie's title and the fence Troy builds in the backyard is a not only a metaphor for either keeping people out or keeping them inside, it is also a barrier which people cannot get past, just as Troy cannot transcend his own history. Washington place the part of Troy beautifully invoking numerous emotions from the audience. Davis and Henderson are excellent compliments to his brilliant performance and Apedo, Hornsby and Williamson round out the cast nicely. Well chosen, each member of this team brings their own nuances to the story. Fences is a powerful, moving and epic story; and with many epics takes a while to develop to its pivotal moments. As a director Mr. Washington focuses on the dialog, relegating the cinematography to the backseat. Although a somber, tragic story several audience members chuckled at several scenes that were familiar to them in their own lives, which many of us upon introsepction and reflection will recognize in our own lives and families as well. 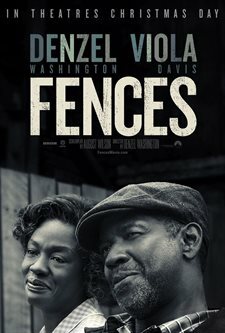 If you are looking for a lighthearted film this holiday season, Fences would not be a good choice. It's heavy subject matter evokes a number of emotions and leave the audience spent. However, the film is spectacular override and certainly worthy of the Oscar buzz it has garnered. Alrighty. Let's see if this deserves the Oscar buzz.